Nothing Like a Waffle Celebration! Waffles are pretty darn near the top of my list when it comes to thinking of celebration foods. A good waffle is crunchy the outside, light and fluffy on the inside, buttery, and not too sweet, and definitely not dense. This waffle celebration comes in the form of corn. We are celebrating the last bits of farm-stand fresh corn you might have on hand, as I did. We are celebrating the last bits of summer sun before diving head-first into the beauties of fall: sweaters, crisp runs, and roasted winter squashes. I wanted to make a vegetarian version of chicken and waffles, and use some fresh corn I had. So. 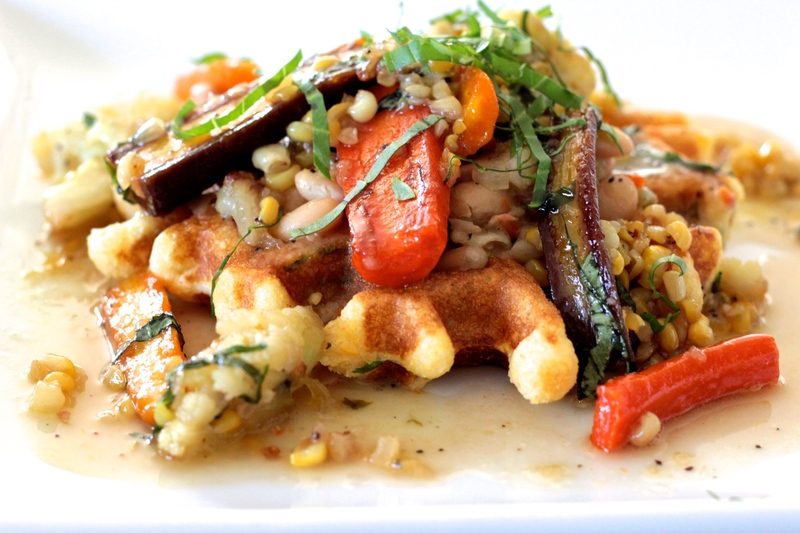 I made basil cornbread waffles topped with white bean cassoulet and maple-glazed carrots and cauliflower. Phew! That’s a mouthful. As are these waffles. 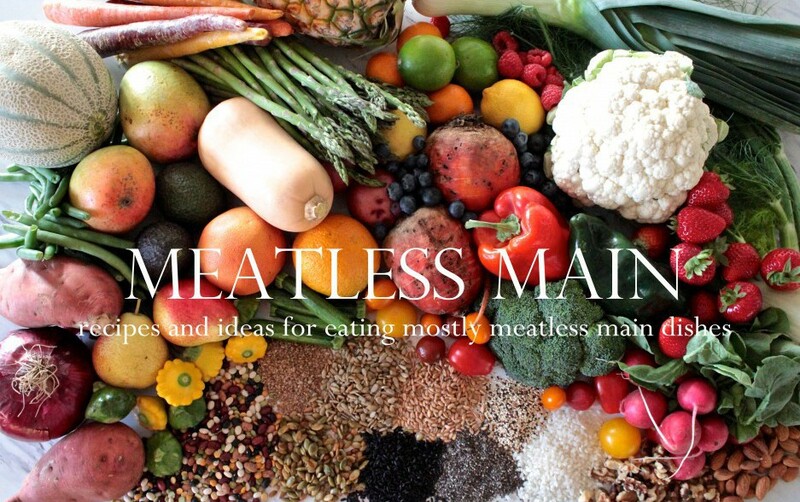 This meal is definitely not for the faint-hearted. And definitely for the celebratory-hearted! For the cornbread, I found this recipe a few years ago, and always keep a container of it in my cupboard, so I can throw together cornbread–or cornbread waffles–lickety-split. It makes the moistest (moist-y-est? most moist? )cornbread I’ve ever had! I added the fresh corn cut from the cob and some fresh julienned basil, threw it on the waffle maker, and voila! Cassoulet is traditionally a bean stew with meat, but I made mine without meat; just a lovely white bean stew. I used dried white beans, and started from scratch, letting them soak for a full 24 hours. You can let dried beans soak for just 8 hours, but I like to let them soak for a full 24, I think it yields a creamier bean. 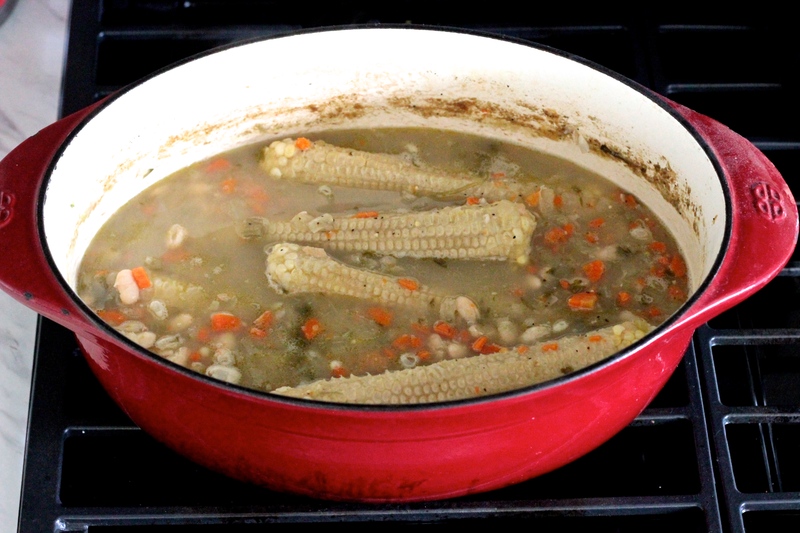 After trimming the fresh corn from the cob, you can use the cobs with all that creamy corn “milk” to sweeten and thicken your bean stew. This is what it’ll look like after simmering for a good 6-8 hours. If using dry beans requires too much of your time and energy, feel free to use canned beans. Look for the altered recipe suggestion in the recipe. Pan-roasting carrots and cauliflower will make them sweet, and adding maple syrup will only sweeten the deal. I used rainbow carrots for more color and fun, but if you have plain jane orange carrots in your fridge, use those. A little lemon zest, a squeeze of lemon juice, and julienned basil on top, and your celebration is complete! FOR DRIED BEANS: Start with the cassoulet, as that will take time to simmer, and you can do the other things while the cassoulet is simmering. If you are using dried beans, this will be your first step, as it’s an overnight step. Soak them in four times the amount of beans you have. So if you are doing 1 cup of beans, soak them in 4 cups of water, and let them sit at room temperature 8-24 hours. Add enough olive oil to coat the bottom of a large pot. On medium to medium-high heat, saute the onion, carrot, and celery with salt and pepper until the onion is soft. Add the beans, corn cobs, cilantro, and about 10 cups of water. Allow to come to a soft boil, then lower heat to low, and let simmer for the next 6-8 hours. Stir occasionally, and you will add another 6-10 more cups of water throughout the simmering process until the beans are cooked through. You will know it’s done when the beans and water come together as a thin stew, instead of looking like just water with beans in it. Remove the corn cobs and whisk in the butter/flour paste. This will thicken the stew and you can let it rest, covered, while you are getting everything else ready. FOR CANNED BEANS: Still do everything in step 2, but you will only add about 6-8 cups of water after sautéing the veggies and beans. You can still add the corn cobs at this point, but chop about 1/2 cup fresh cilantro, minus the stems (as you won’t have that long simmer time for the cilantro to cook down and sort of dissolve/melt into your stew). Simmer the stew about 20 minutes, and add the flour/butter paste. You may not need to add as much of the paste to thicken the stew. Start with 2 tablespoons and add more if desired (just remember it’s equal parts flour/butter, mashed together). While the beans are simmering, mix together the waffle ingredients. Use your favorite cornbread recipe and mix according to directions. Add 3 cups fresh or frozen corn, and the 1/4 cup julienned basil. Make your waffles. I usually let mine rest on a cookie rack so they don’t get mushy while I’m making everything else. In a large saute pan, add enough olive oil to coat the pan and heat to medium-high. Add the carrots and cauliflower and season with salt and pepper. Let the veggies cook until there’s a little golden color on them, then add the 3 cups fresh or frozen corn and stir, sautéing for a few more minutes. Lowering the heat to medium, add the basil and maple syrup and let simmer until you can smell the basil. 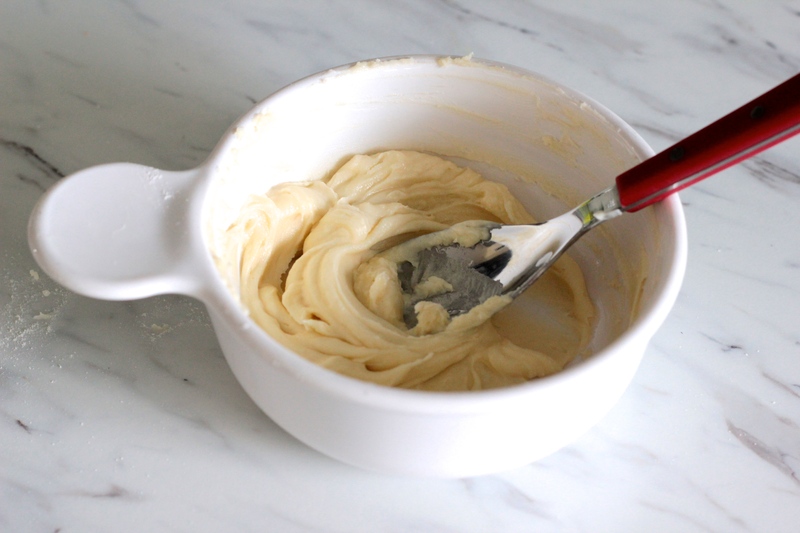 Turn off the heat and whisk in the butter, whisking until it all comes together as a sauce. You are definitely going to need some acid to cut all these rich flavors, so you can add both the lemon juice and zest at this point, right into the sauce, or add just the zest in the sauce, then serve lemon quarters on the side so everyone can squeeze their own fresh lemon overtop their waffles. Also top with more fresh basil.